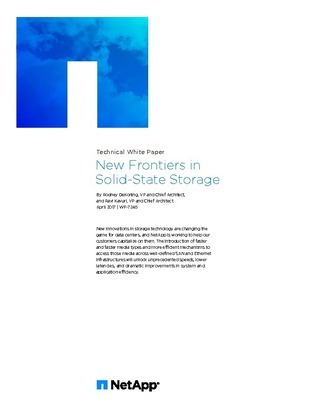 Innovations in solid-state storage technologies are becoming data center game changers. Efficient mechanisms that access faster types of media across well-defined SAN and Ethernet infrastructures will unlock unprecedented speeds, lower latencies, and dramatic improvements in system and application efficiency. This is all based on three advances: Nonvolatile Memory Express (NVMe), NVMe over Fabrics (NVMe-oF), and new storage-class memory (SCM). Access this white paper to learn about these areas of innovation and the impact they are projected to have on data centers and hybrid clouds.